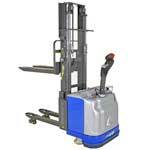 Lift Safe’s electric stacker’s are the key tool to lift and store goods within limited space for maneuvering. 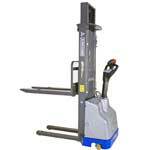 The varied options on these stacker’s make them the ideal tools for a wide variety of applications. 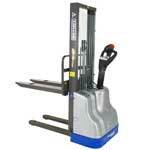 Although the Speedy Light is our entry level electric stacker, nothing is left to chance. 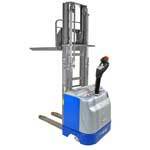 Its agility, simplicity and versatility are the qualities that make it a powerful, low cost, electric pedestrian stacker truck that is suitable for any production environment in both small and large companies. Manoeuvrable and ergonomic but, at the same time, solid and reliable, master light represent the most successful compromise between the requirements of power and agility in reduced spaces. 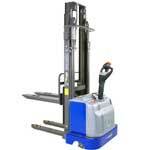 Delta E is the most concrete answer to the requirements of power, ergonomics and safety within the movement sector, representing the ideal solution for intensive works involving the movement of goods on pallets in medium-sized/large environments. 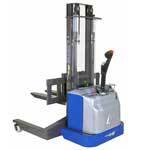 Delta TP offers the perfect solution for the problems regarding the movement of loads on slopes; thanks to the possibility given to the operator of hydraulically lifting the support legs, it is possible to easily overcome the irregularities that may be present on the floor, as well as to simultaneously move two pallets. Delta TRX is the most effective answer to the requirements of storing and lifting goods placed at great heights from the ground; the specific structure and materials used ensure excellent performance and total safety when regularly moving loads, even at elevated heights. 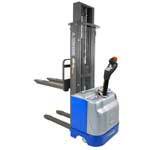 Max electric stacker is the lift truck that best expresses the concepts of robustness and power; designed and manufactured with special structure and materials, it can be used to move heavy and extra-heavy loads in total safety conditions.